Back on Yoga for Runners series. If you’ve missed the last few – check the one on upper body stretches here and yoga for breathing techniques while running here. And this one is about the nagging and the most damaging – IT Band (Iliotibial Band). 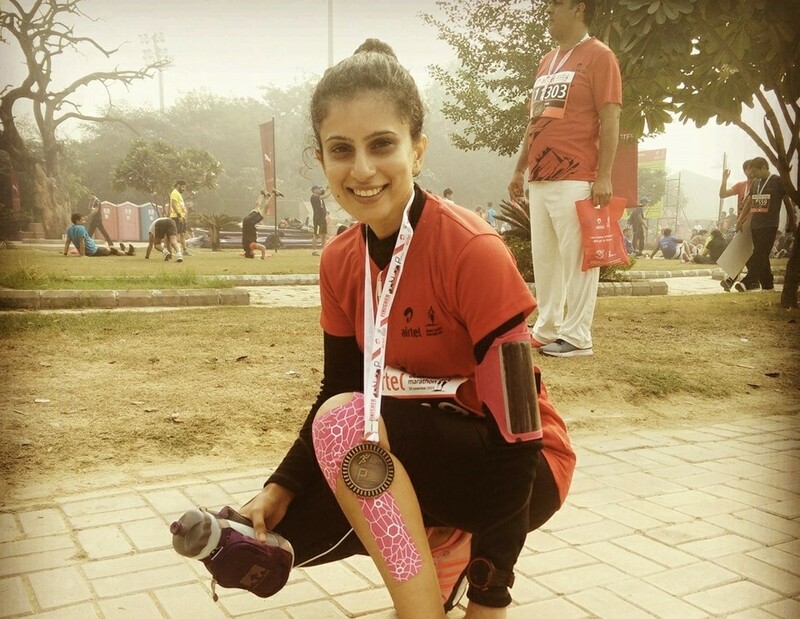 I suffered from a painful ITB 5 days before my first big run event in 2015. I read a lot online and found a very interesting article that recommended the Marine Corps method of full immobilization for three days before a big event when injured with an IT Band. I was race ready 3 days later and patted myself for a good sub-2! However – I would be stupid enough to say that this is how you fix the IT Band! Of course, I had to seriously look at what was wrong! How to rebuild my leg and hip strength over a period of time. ….With constant mindful stretching, the IT band injury has not come back to me in the last three years. Constantly aware of the pain an injury can cause to a runner is probably the biggest reason am not letting go of the stretching. Always remember – Stretching for runners should be passive and thus relaxing. Take a deep breath, give yourself a moment to relax and enjoy the stretch. Simple stretching (other than yoga) is active. However, it is holding the stretch and then breathing is what allows the body to relax and absorb the benefits. All good things come only when completely relaxed. So, Ritu (my yoga acharya) and I have worked on a few sessions together (helping me stay away from a major flare up). We picked out a few from the many yoga stretches available – ones that are keeping me away from a major flareup. Revolved Triangle Pose (Parivratta Trikonasana) – This works phenomenally as an IT Band stretch, both as a preventive and as a healer. I would recommend you to take a bloc if you are already suffering with the injury. Don’t overstrain. As I bend down to touch my hand on the ground, I can feel the pain battling with the stretch. You can get the best out of this pose by pressing firmly through your back heel. Always gently release the twist. Repeat for the same length of time on the opposite side. While in the pose, you can rest your hands on the ground or take them behind your back. Breathe deeply and hold for at least 30 seconds. The leg that is straight on the mat, the heel of the foot must be pushing out. Stay in this position for one to three minutes depending on your choice and comfort. Keep the shoulders pressing on the mat. They shouldn’t be rising with the leg. Go only as far as you are comfortable. You don’t have to draw the leg to the floor. 4. Eye of the Needle (Sucirandrasana) – An extremely soothing pose for the IT Band injured as it involves the pelvis and the legs. It targets the outer thighs and just kills the tension because of the pain. Also recommend this pose to people who sit the whole day working infront of their laptops. But what I love about it the most is that it soothes the tension in the affected area of the outer thigh. Draw your right knee in toward your chest. Clasp both hands around your right shin or thigh. How about the back? – Flat on the mat. Where’s the gaze? Tuck your chin slightly and gaze down the center line of your body. Hold for up to one minute. Release your leg and place your right foot on the floor. Repeat the pose on the opposite side for the same amount of time. As always it’s all about consistency and not a one time effort in the case of injuries. Neglect will bring them back again and again! Never forget to warm up and cool down for your runs. Avoid running on uneven surfaces that put unnecessary stress on ligaments. Don’t forget to pencil in regular rest days, too. You (and your body) deserve it! Thanks for giving such a good exercises. Great, timely dose to runners,thanx for reminding usefulness of yoga for runners of all ages.